For many homeowners in New York City, NY, Manhattan, Brooklyn or Queens, working out exactly where property boundaries lie can be a challenge. Particularly if you intend to build near the edge of your property, accurately line staking to indicate the correct boundary is essential. We provide experienced residential and commercial surveying services, making sure you can be certain where your boundaries are. This information not only helps to ensure you don’t encroach on your neighbors’ properties, it also helps neighbors to make sure they do not infringe on yours, minimizing the risk of disputes further down the line. Builders can’t begin to work of a construction project until the dimensions and features of the construction plans are accurate mapped on the ground. The best-drawn plans and blueprints can fall short if they are not implemented properly, or if unforeseen issues at the building site end up creating problems during the construction process. Construction staking enables the builders to visualize the exact location and dimensions of all the features contained in the plans. Focuses directly on the foundation of a structure, providing a compelling “snapshot” of the foundation as of a certain date. A surveyor from Rampa Land Surveying will come onto the property (usually at the builder or lender’s request) to document this critical stage of construction, and then the survey will plot the location and dimensions relative to property lines, and in comparison with previous site plans or plats. Elevation readings may also be taken throughout the foundation to identify any high or low points, serving as a baseline measurement. 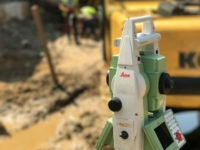 Here at Rampa Land Surveying we provide comprehensive data reports to track any structural movement (horizontal or vertical) due to ongoing and future construction activities (underpinning, excavation or demolition) by installing surveying targets at specific location on neighboring structures near a construction site. Optical Monitoring Survey services are provided on a bi-weekly, weekly, or daily basis meeting our client needs. Many properties in Staten Island, Bronx or New York City, NY are required to comply with the 1988 Technical Policy and Procedure Notice # 10/88 (TPPN 10/88) of the New York City Department of Buildings (NYCDOB). Our commercial land surveys include optical monitoring – the procedure which must be undertaken for all larger buildings within 90 feet of your New York City construction site to ensure compliance with TPPN 10/88. An optical monitoring exercise is needed to check initial positioning before work commences. Unfortunately, demolition, foundation building and similar activities can have a negative effect on structures near the work. This is particularly the case for older buildings. We can complete the necessary inspection work in Manhattan, Queens and elsewhere across the city, giving you the information you need to comply with TPPN 10/88. Pile Layouts, Anchor Bolts Layout, & Column Lines Layout.